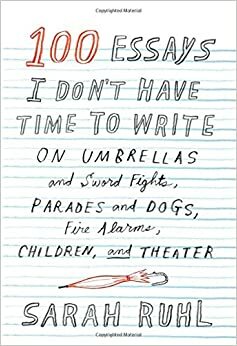 The French Exit: Some quotes from "100 Essays I Don't Have Time to Write"
Some quotes from "100 Essays I Don't Have Time to Write"
I read this excellent book the other night, by playwright Sarah Ruhl. I love books like this that are divided into lots of thoughtful little chunks or essay-lets so they're easy to finish in one or two sittings (since you can always read one more, similar to how you can always add another paperclip to a glass of water, or keep getting Google results no matter how many zees you add to the end of "pot rulezzzz..."). It's a lot like the Misha Glouberman book I mentioned recently, but in the end I liked it better, as Glouberman's self-congratulating got a little tiresome at points and Ruhl doesn't do that. "I found that life intruding on writing was, in fact, life. And that, tempting as it may be for a writer who is also a parent, one must not think of life as an intrusion. At the end of the day, writing has very little to do with writing, and much to do with life." "The umbrella is real on stage, and the rain is a fiction. Even if there are drops of water produced by the stage manager, we know that it won't really rain on us, and therein lies the total pleasure of theater. A real thing that creates a world of illusory things." "In ancient Greece, comedies used to be appetizers in the form of satyr plays performed before the main course---a tragedy. Now we don't have daylong festivals of both comedies and tragedies, so now do satyr plays need to be contained inside tragedies? (That is to say, the dark comedy?)" "Be suspicious of an expert who tells you to cut a seemingly unnecessary moment out of your play. The soul of your play might reside there, quietly, inconspicuously, glorying in its unnecessariness, shining forth in its lack of necessity to be." "So what is a bad-to-indifferent poet to do? Enroll immediately in playwriting school. Put the bad poetry in the mouths of outlandish characters. It might make the bad poetry funny instead of sad." "Nakedness is always real on stage, just as eating on stage is real, and kissing on stage is real, and dogs on stage are real---and one can only bear reality in small doses." "If you are acting in a play of mine, and I say this full of love for you, please, don't think one thing and then say another thing. Think the thing you are saying. Do not think of the language of the play as a cover or deception for your actual true hidden feelings that you've felt compelled to invent for yourself. Don't create a bridge between you and the impulse for the language; erase the boundary between the two. Think of subtext as to the left of the language and not underneath it. There is no deception or ulterior motive or 'cover' about the language. There are, instead, pools of silence and the unsayable to the left or to the right or even above the language. The unsayable in an ideal world hovers above the language rather than below." "Being dead is the most airtight defense of one's own aesthetic."